Welcome to ALGO 2017 in Vienna, Austria! The annual ALGO congress is the leading international gathering of researchers on Algorithms in Europe. ALGO 2017 hosts also the Parameterized Complexity Summer School as a pre-congress event. ALGO 2017 is co-located with Eurocomb 2017. 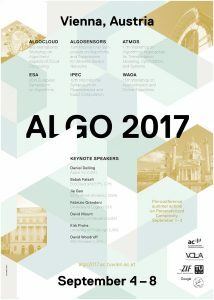 The ALGO congress is organized by the Algorithms and Complexity Group of the Faculty of Informatics, TU Wien, Vienna, Austria.